Lexar Professional 1000X is designed for your sports camcorder, tablet or smartphone. It lets you quickly capture, play back and transfer multimedia files, including 1080P full HD, 3D, and 4K video, with a read transfer speed up to 150MB/s. The cards leverage UHS-II technology is backward compatible with UHS-I devices for high speed performance. 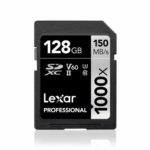 Coming with a limited limited lifetime warranty and backed by technical support, Lexar Professional 1000X ensures you performance, quality, compatibility and reliability. 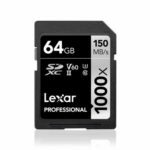 Adopting high-speed cards leverage UHS-II (U3) technology, Lexar Professional 1000X provides a read transfer speed up to 150MB/s and write transfer speed up to 90MB/s. Designed for your sports camcorder, tablet, or smartphone, the premium memory solution gives you the speed and capacity you need to capture, transfer and share more adventures on the go. 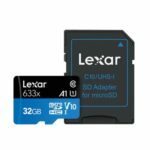 Whether you are a professional photographer, videographer or a mobile device power user, Lexar Professional 1000X lets you quickly capture, playback, and transfer multimedia files, including 1080P full HD, 3D and 4D video – making it easy to preserve more than 36 hours of your greatest moments and then relive the action. Great for use with your tablet or smartphone, the cards make it easy to quickly download or save all your favorite media files, including the highest quality movies, photos and songs. 1000X Micro SDXC cards are also backward compatible with UHS-I devices, performing up to the maximum thresholds of UHS-I speed capabilities. The cards also work with older, non-UHS-I devices, performing at class 10 speeds. The high speed performance of Lexar Professional memory cards dramatically accelerate your workflow from start to finish, so you can save time, beat your deadline, and gain competitive advantage. All Lexar Professional line memory cards comes with a limited lifetime warranty and are backed by expert technical support. Lexar Professional 1000X undergo extensive in the Lexar Quality Labs, facilities with more than 1,100 digital devices, to ensue performance, quality, compatibility, and reliability.